Archive for Puchimas! -Petit Idolm@ster-. It's clenched buttocks all the way down. I have no idea how Vividred Operation will wrap itself up in its remaining three or four episodes. Seeing as how it's still introducing and developing the relationships among the characters, it will either feel really rushed or we'll be blessed with a second cour of clenching butts in tiny short shorts. It's possible my expectations are a little too high for this show, now that I think about it. Either way, this is still far and away the best show of the season, even if Princess Kraehe never performs any ballet. The best team in the best show. 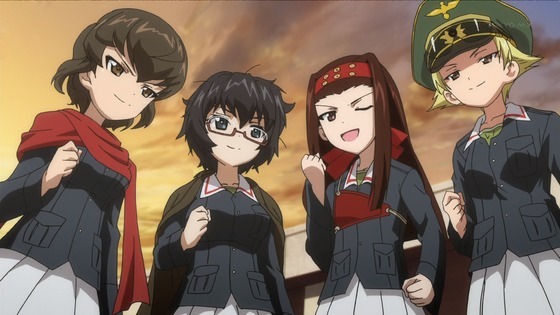 I'm undecided as to whether or not the final two episodes of GIRLS und PANZER qualify as part of the winter 2013 season. They were delayed from the autumn 2012 season and should probably belong there with the rest of the series, but then again they did actually air late in winter 2013. There are only 40-some minutes of new material, but that's more than Teekyuu, so it arguably has as much right to be here as the various two-minute shows. Whatever the case, these two final episodes of GIRLS und PANZER were far and away superior to any of the other shows from winter 2013. Still perky despite it all. As in the first season, of Puchimas! Petit iDOLM@STER, I like the Puchimas!! Petit Petit iDOLM@STER Hibiki more than the Hibiki from the regular iDOLM@STER anime. 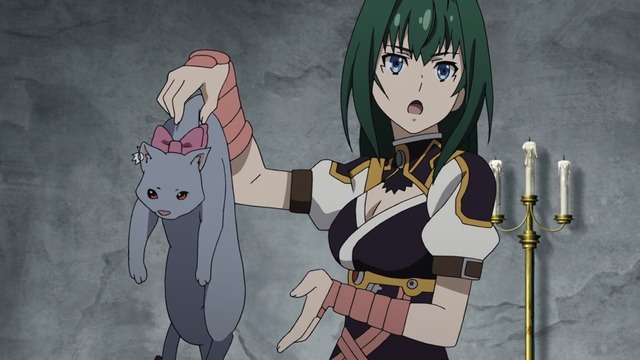 This is mostly because in the regular anime Hibiki is sort of a gag character with pretty broadly drawn defining characteristics, and they never quite worked for me in that context. Frankly, I find Hibiki's pet alligator harder to accept than believing Takane might be from the moon. (Speaking of which, Takane from The iDOLM@STER TV is eccentric and mysterious. Puchimas! Takane is a nutjob.) 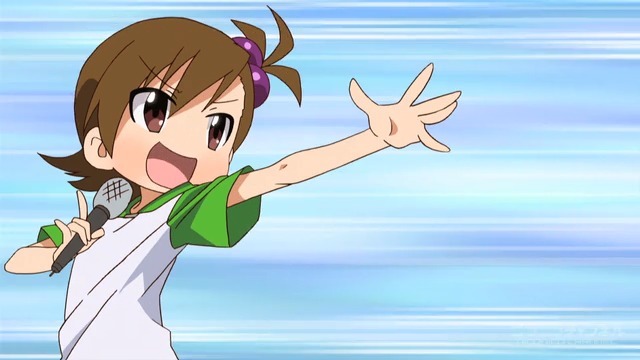 Hibiki is a gag character in Puchimas! as well, but every character in Puchimas! is a gag character. Curiously, Hibiki's defining role as a gag character in a non-canonical gag anime is not her canonical gag from the canonical non-gag anime. 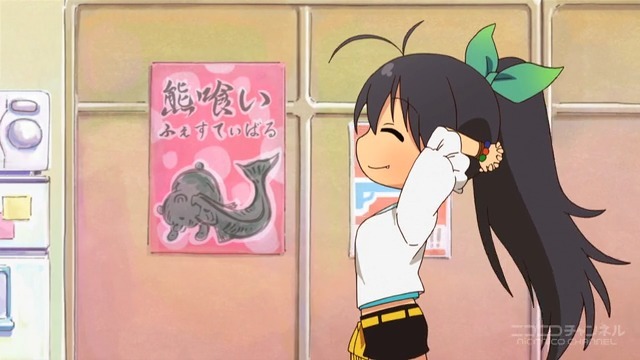 (This is my way of saying that "has a lot of animals" is not Hibiki's primary attribute in Puchimas!!. Rather, Hibiki takes the role of the beleaguered straight man, constantly vacillating between moments of incredulous Takane-inspired despair and regular moments of more conventional low-level suffering. Hibiki's affectations are influential enough that I've caught myself mimicking her exasperated sigh during darker moments of comically bad fortune, to tell you the truth. So what about Hibiki from the games? I can't give this question a straight answer because I don't actually know all that much about Hibiki from the games. In fact, I'm only familiar with game-type Hibiki from Shiny Festa and Internet videos. Regarding the former, my lack of rhythm prevents me from advancing too far in the game. With regard to the latter, I've only seen a few game-play clips from the proper games; mostly I've just watched all-singing, all-dancing performance clips. As far as those are concerned, Hibiki, Takane, and Miki are all equally valuable to me as members of Project Fairy. That really is a well-balanced and nicely harmonized trio. Best project. Best fairy. One of my favorite shows from the spring 2014 season—not necessarily reflected in its "objective" score—is Puchimas!! 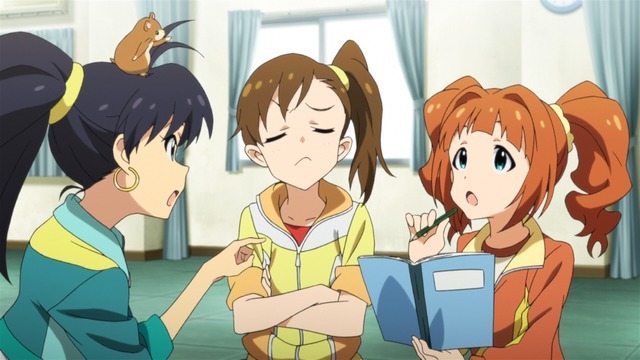 Petit Petit iDOLM@STER, the second season of a gag anime (presumably non-canonically) based on the iDOLM@STER franchise. Curiously, the blobby little puchis themselves are probably my least favorite part of the show.